I’m releasing chapter two of Firebrandt’s Legacy for patrons to read at my Patreon page today. 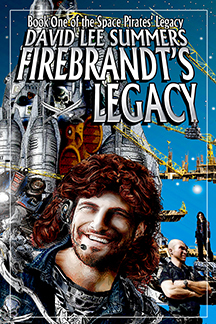 Firebrandt’s Legacy is a book that collects my short stories about space pirate Ellison Firebrandt and his crew in one volume. These short stories have been released in several anthologies over the years published by several different publishers. I suspect it’s unlikely anyone besides me and my wife have read them all! Even if I’m wrong about that, I do plan to add some new short stories to the mix. What’s more, each of the short stories is being completely re-edited for this volume and I’m also doing “Behind the Scenes” posts for each story to give patrons a glimpse into the history and my inspirations for each story. Ellison Firebrandt fights the good fight for Earth. Under a letter of marque, he raids the ships of Earth’s opponents, slowing down their progress and ability to compete with the home system. On the planet Epsilon Indi 2, he rescues a woman named Suki Mori from a drug lord, only to find she isn’t so happy about living a pirate’s life. However, when the captain finds a new engine that will make him the most successful pirate of all, Suki is the only one who can make it work. Now Firebrandt must find a way to keep his crew fed and his ship supplied while relying on a woman who barely trusts him and while every government in the galaxy hunts him to get the engine back! I have unlocked the first story at my Patreon page. Without paying anything, you can check out Laura Givens’ beautiful cover in full resolution and read the first story to decide if you want to support this project. Once this project is complete, I plan to continue with the other three books in the Space Pirates’ Legacy series, so you’ll find good stuff there for a while. It would be fair to ask why you should support this effort on Patreon. After all, I have a good job operating telescopes and I make income from my other books. Can’t I just assemble this book and sell it like the others? My goal here is two-fold. First of all, this isn’t the only project I’m working on. I’m also finishing off edits on my steampunk novel Owl Riders and I need to start work on my second Wilderness of the Dead novel. Knowing that I have patrons who expect to see at least one story from me each month is a great motivator for me to actually make sure I keep this project moving forward while I work on those other projects. What’s more, my “day” job’s salary is paid through government agencies whose budgets are set by congress each year. People in my position can and have been laid off with minimal notice in times of budget shortfalls. While my job is quite compatible with my writing and I have little desire to leave, I never know when I might find myself unemployed. While I have no complaints about my salary, it’s hardly extravagant. Money from my books and sources such as Patreon are necessary for me to afford travel to conventions and give presentations about writing and even astronomy. Also, getting money through Patreon allows me to pay other artists, such as Laura Givens, who did the wonderful cover for Firebrandt’s Legacy. I’m also hoping to put together a full-cast audiobook of Firebrandt’s Legacy and support on Patreon helps me pay actors a fair wage to do that. In other words, lots of fun things can happen through your support. I’m honored by those who’ve already decided to support me and I hope others will join them. Click the button below to visit my page, read the first chapter, see the high resolution cover and decide if you’re brave enough to join the crew of the Legacy on its voyage of adventure. As a fan of Leiji Matsumoto’s work, I was pleased to discover a new manga from him plus an anime that I hadn’t seen before. 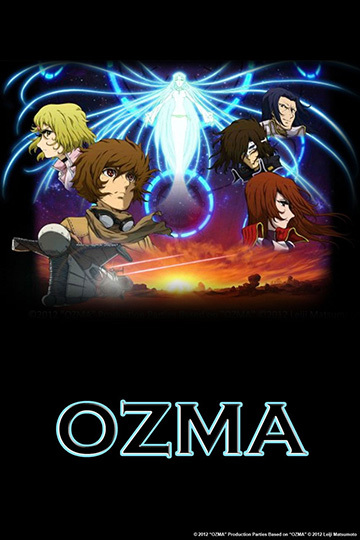 The anime was the 2012 six-episode series Ozma which is available to stream at Crunchyroll. 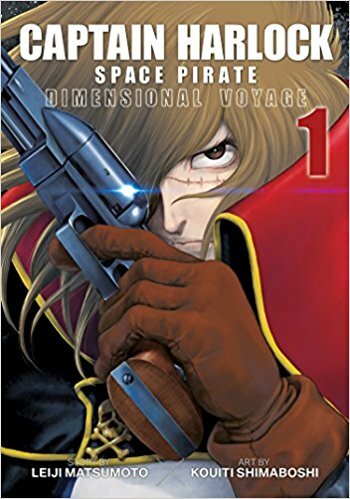 The manga is Captain Harlock: Dimensional Voyage. Ozma tells a story of humanity struggling to survive on a future Earth that has become a desert world. Sam Coyne is a young crewman aboard the Bardanos, a ship of the sand that scavenges the world for useful items. While searching for Ozma, the mysterious sand whale, he rescues a girl named Maya, who is being chased by the Theseus Army and takes her back to his ship. Captain Bainas of the Bardanos puts Maya under her protection. As the story proceeds, we learn that there are two factions on this future Earth: the Ideal Children who are carefully genetically engineered and live for a long time by transferring their thoughts into new, grown bodies and the Natura, who propagate as most humans have over time. The Ideal Children were hunting Maya, while she, like Sam, was seeking Ozma. My first reaction to Ozma was that it could be summed up as Leiji Matsumoto’s Dune. That turns out not to be exactly right, but there are a few similarities. The strongest elements of this anime are the cool retrofuture look of the show along with some of the Bardanos crew. I especially liked Captain Bainas, who reminded me of a more accessible Emeraldas, and Dr. Luna who seemed like a female Dr. Zero. Also, there are some great battle scenes between the Bardanos and the Theseus Army. My sense after getting to the end of this three-hour short series was that with some judicious cutting and little rewriting, this would make an awesome two-hour movie. In particular, the series needed to work on the character of Sam, show us more of his relationship with the Captain and with his childhood friend, Mimay. Also, the ending could be strengthened with a little more information. On looking up more information, it’s a little unclear how much Leiji Matsumoto was actually involved in this anime. I gather it was based on an unpublished manga from the 1980s, but I haven’t found out whether he had much involvement in the development of the anime or not. Call this worth a watch if you’re a Matsumoto fan and have a little spare time. On the other end of the Leijiverse spectrum is the manga Captain Harlock: Dimensional Voyage. When I first saw this announced, I didn’t expect much. It sounded like a simple retelling of the Mazone story from the 1978 Captain Harlock series done by a new artist. I pretty much planned to give this a pass, but a coffee coupon sent me in to my local Barnes and Noble store where I happened to see it on the shelf. A brief browse convinced me to buy the first issue and I’m glad I did. The first thing I noticed was that Kouiti Shimaboshi’s art really did Leiji Matsumoto proud. The characters look like updated versions of the classic characters from the Leijiverse. What’s more, Matsumoto and Shimaboshi pulled the best elements from some forty years of the Harlock “canon” and combined them in this story. I recognized elements not only from the original, but Harlock Saga, Endless Odyssey, Queen Emeraldas, and even the Harlock: Space Pirate movie. In the original, the prime minister felt like a broad satire. In this, the character came off as a razor-sharp critique of modern politicians. I liked seeing Chief Ilita from Endless Odyssey as Harlock’s main military opponent. He always struck me as the most dangerous of Harlock’s foes, mostly because he actually was an honorable and competent man. So far, we haven’t seen any sign of Harlock’s adopted daughter Mayu, so it’ll be interesting to see if they work her into this story. My only complaint was that the volume proved to be quite short. I definitely will give volume 2 a look and will see where they go with this. In this last week, I’ve thought a little about my own Captain Firebrandt and how much Captain Harlock may have influenced him. The first anime I saw featuring Captain Harlock was Galaxy Express 999 when it played on the SciFi channel somewhere circa 1993, about five years after I created Captain Firebrandt in 1988. I suspect Harlock’s appearance in Galaxy Express 999 is one thing that gave me the nudge to write a novel about Captain Firebrandt and explore the character more. After that point, the next time I saw Captain Harlock was in 2015, soon after watching Space Battleship Yamato 2199 and learning about Harlock’s relationship to the original series. I think a Harlock/Firebrandt crossover story would be fun to do, but doubt it could happen any time soon, unless I did it as fan fiction for my own enjoyment. If you want to see the latest adventures of Captain Ellison Firebrandt, please consider supporting my Patreon at http://www.patreon.com/davidleesummers.